The December issue of QST came out today in digital form. It contains the Field Day results. We were just under 2000 points behind W4EZ, while Watching 4IY was a bit less than 3000 points behind us. 1) it might be interesting to get with the EZ folks and see if we can get a friendly / collaborative competition going. I suspect it is always there, but it would be interesting to exchange info on what we both do, how it is similar and how it is different. We might be able to give each other ideas that improve both efforts. 2) It’s about time to start planning the 2019 effort. It should contain ideas to improve operations on the low bands. With 10 and 15 pretty much out of play (10 more than 15), 40 and 80 are even more important to our results. In any case, we can pat ourselves on the back for a very short time (don’t hurt that keying arm, though) before we get started on next year. And with the number of spotless days for the year officially at 60% today, and the percentage guaranteed to be above 51% overall for the year, perhaps we need to take up a collection to buy some sun spots. Seriously, congrats to K6EI, K0XI and the folks who put this together, and all of team WVARA for the effort involved in setting yet another record. 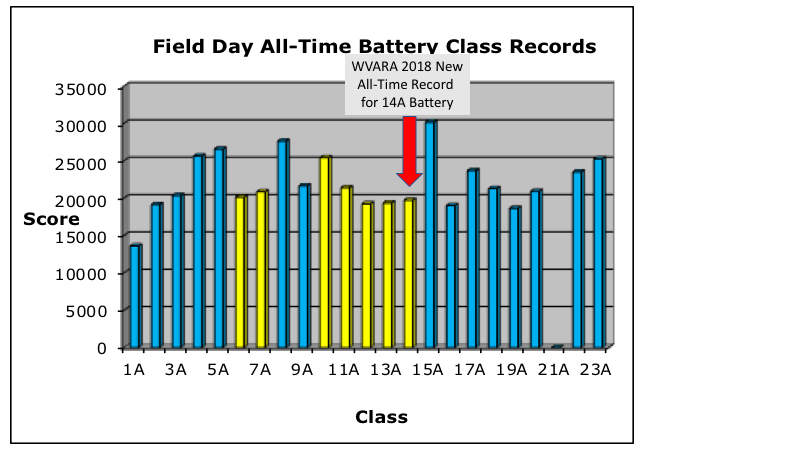 One obvious question: does WVARA want to pursue a new Field Day category record in 2019?